Don’t just sit there wishing your company had a sabbatical program. Convince your company’s decision makers to give you one! 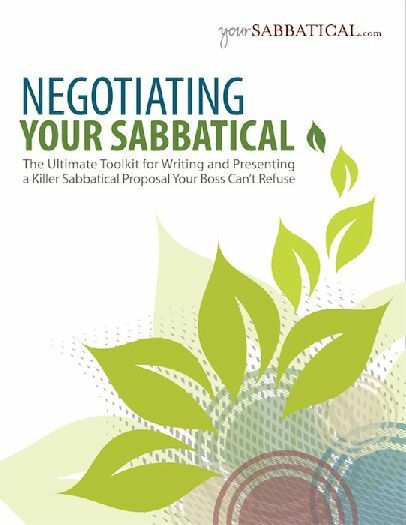 With Negotiating Your Sabbatical you’ll have access to the ultimate toolkit for preparing a winning sabbatical proposal. yourSABBATICAL’s Negotiating Your Sabbatical enables even the mildest mannered employee to assemble an intelligent, articulate, and ultimately convincing proposal. This toolkit is loaded with solid strategies, sage advice, and an arsenal of resources that give you the tools and confidence you need to convince higher ups that giving you a sabbatical is a great idea. Simple to follow, step-by-step instructions guide you through the process of zeroing in on your company’s sabbatical benefit areas, preparing a killer written proposal, and preparing yourself to negotiate the particulars of your career break with your company’s leaders. Negotiating Your Sabbatical includes enlightening checklists, frequently asked questions, an accountability log, current data on sabbatical trends, negotiation scripts, sample sabbatical proposals, success stories, an expert proposal template, and action challenges that give you the confidence to launch a powerful sabbatical program for yourself. * Talk intelligently about why companies offer sabbatical programs for their employees. * Determine benefits from your sabbatical that will best influence your employer. * Use Sabbatical Fast Facts – powerful statistics, current research, and testimonials from corporate executives – to influence upper management. * Identify the common obstacles to winning a sabbatical and easy ways to avoid them. * Learn how your sabbatical can benefit your team while you’re away. * Write a sabbatical proposal that will get a “yes” from even the most hardened traditionalists. * Relate your sabbatical benefits to “the bigger picture,” such as industry trends and company goals. * Complete a preliminary “Work Coverage Plan” to demonstrate how your sabbatical can actually strengthen the company while you’re away. * Strategize on how convert your boss into a “champion” for your sabbatical. * Recognize the critical value and positioning of your sabbatical proposal. * Learn the top 3 conditions of your work and performance that will influence positive success. * Prepare for the 6 critical elements of your sabbatical negotiation. * Learn 3 important strategies for keeping the negotiation on track. * Prepare for the 5 possible reactions from your boss with expertly scripted responses. Yes, you can successfully negotiate a sabbatical with your company. Even a paid one! By Barbara Pagano, Elizabeth Pagano and Gloria Southerland. 84 pages. Publication date: August, 2010. Spread the word about it and earn 51.00% of the purchase price on sales you refer.